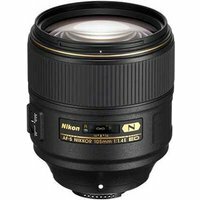 The Nikon 105mm f1.4E ED AF-S lens is a fast aperture prime designed for FX-format Nikon digital SLR bodies. The only 105mm autofocus (AF) lens on the market with an f/1.4 maximum aperture, this is an exciting addition to the Nikkor range and is aimed at professionals who want to reach new levels of finesse in portraiture and fashion. Whether you're shooting in the studio or outside at dusk, the lens' all-new optical construction delivers unrivalled edge-to-edge sharpness and beautiful bokeh.